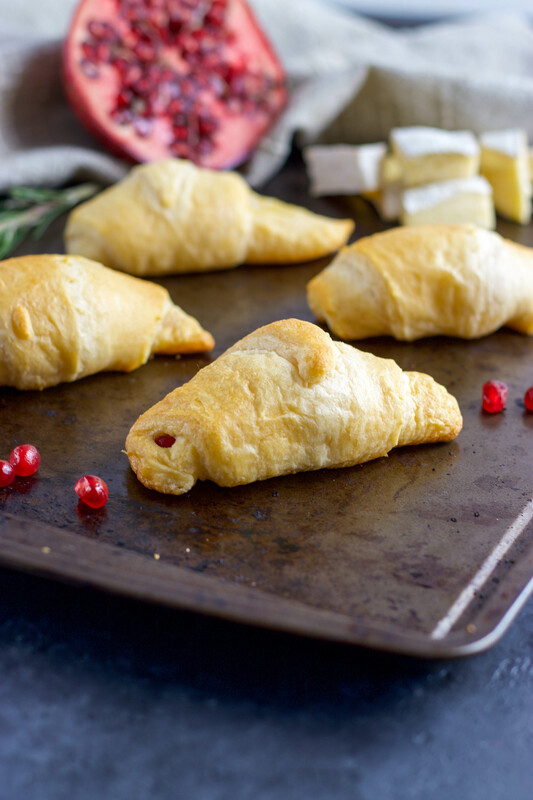 Pomegranate, Rosemary and Brie, Oh My! That’s certainly what you will be singing once you bite into one of these cheesy goodies, that’s for sure. This holiday, skip the butter and rolls and add a bit of flair to what we all love so much: bread! Every Thanksgiving and Christmas, Anthony’s mom puts together one heck of a spread. I mean, she goes all out. And one of the things Anthony always makes sure is on the list is his Crescent Rolls. Bread has always been Anthony’s favorite part of meals, I swear. I can make a big dinner with all of his favorites, and if there isn’t any bread, well, his dinner wouldn’t be complete. He hasn’t been as big on bread at dinner as much these days, but we still will have some with an Italian dish or a loaf of cornbread with chili, but it’s become more of something we have intermittently. And crescent rolls are that as well. I actually picked up a couple of the ready to bake crescent rolls recently because I knew it would make him very happy. And when I grabbed them, I thought about how I could spice them up a bit, you know, something aside from the same old, same old. So naturally, I scanned the fridge when I got home and tried to figure out what would be a good combination. Since I have been obsessed with pomegranates lately (they are not only tasty, but they make food 100 times prettier every time), I had a few hanging around. I also had a wedge of Brie because it piqued my interest at the grocery. And then I just needed something else to round it out: the Rosemary. Perfect. So that afternoon, I rolled a piece of Brie, some pomegranate arils and freshly chopped Rosemary into the crescent rolls and now I essentially never want a plain crescent roll or croissant for that matter, pain again. EVER. Christmas is next week and if you noticed, there’s a touch of red and green to this recipe. And gold as well if you count the perfect golden brown of the rolls themselves! So needless to say, adding this to your holiday dinner is 1. so crazy easy and 2. so delicious that you may have to remind yourself not to fill up on bread! Save room for all of the other goodies! If you have a favorite croissant or crescent roll dough recipe, by all means, start there. Since we are in the heyday of things, convenience most likely will outweigh everything. And to be honest, we actually look forward to these rolls over Christmas. There a special tradition that have part of our holiday meals for years now. But while we won’t be getting rid of the rolls themselves, we will just be adding a little oomph to them and all will be the merrier for it! Preheat oven according to package or recipe. Chop Roemary and rinse and pat dry pomegranate arils. Cut Brie into approx. 1 1/2 in. pieces. 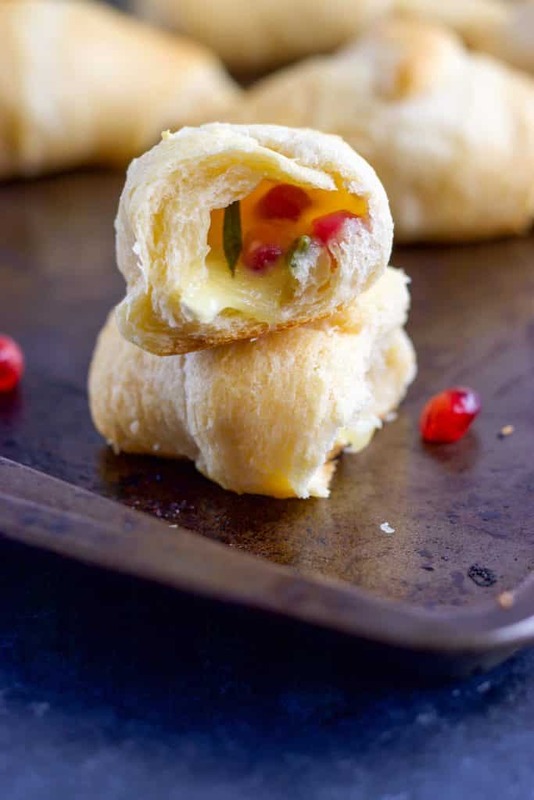 Roll into crescents and line on a parchment lined baking sheet. Bake for 9-12 minutes or according to your package instructions, until golden brown. Allow to cool for 2-3 minutes and serve immediately. Thanks so much Albert!!! They are a new fan favorite around here!! Oooh, these sound amazing!!! What a great idea! What a wonderful idea! 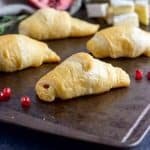 These stuffed crescent rolls sound so delicious! I love the way you played with flavors here but kept it so simple. I’ve actually never worked with crescent dough even though it’s so easy to find. We don’t have it around often, but when we do, my husband is verrrry happy! Thanks Whitney! Hope you love them! These look and sound amazing! I bet they’d be a huge hit at any of our Christmas get togethers! Oooh I love this combo! Bread is one of my favorite parts of dinner, too, and these are such a fun way to make it a little fancier – while still being simple! Yum! They definitely feel fancy, Melissa!!! And yes, simplicity at its finest! Oh my! I think I could ALL of these in one sitting. How tasty- making these this weekend! Yes, I think I share the same issue! These were so easy to make but my entire family thought they were the most delicate and delicious rolls ever! Yes!!! I love hearing this Meme! These are genius & sooo good! I can’t get enough pomegranate these days!! Oh yea, the second they are in season I go crazy! wow Lorie, these look amazing, I can’t wait to bring them to my families Christmas eve party! Hope everyone loves them, Nerry Christmas!! This is such a fun idea. I love crescent rolls, but never thought to stuff them with cheese! The combination of the brie and pomegranate and rosemary is stellar! 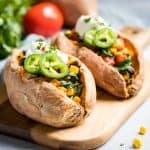 This is so simple but looks so flavorful and unique! Definitely a super simple way to shake up everyone’s fave! Little known secret, my dad and I share a bond over our love for crescent rolls. I surprised him with this and he loved it! So delicious, thank you!